A few months ago Joni Webb, of Cote de Texas, wrote a post about the owners of Aiden Gray, Randal and Sally Weeks. 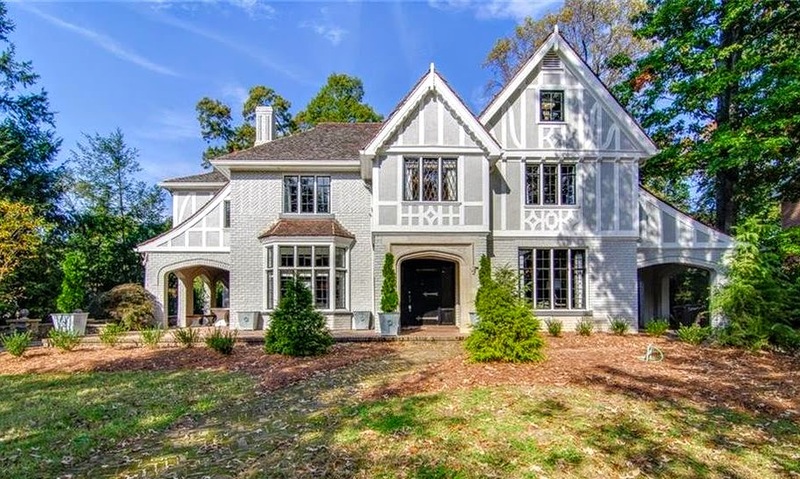 The Weeks purchased a 1929 Tudor Home in High Point with the intent of using it as a vacation home, as well as for trips to High Point markets. After making the purchase the Randal Weeks set out to completely restore the property. The result is absolutely stunning. 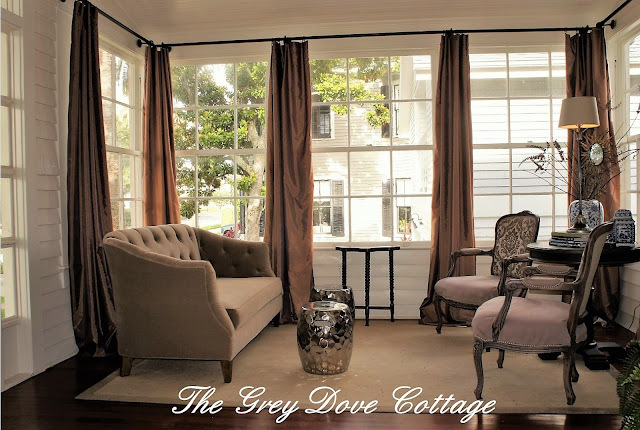 You may read about the transformation of the home here on Cote de Texas blog. 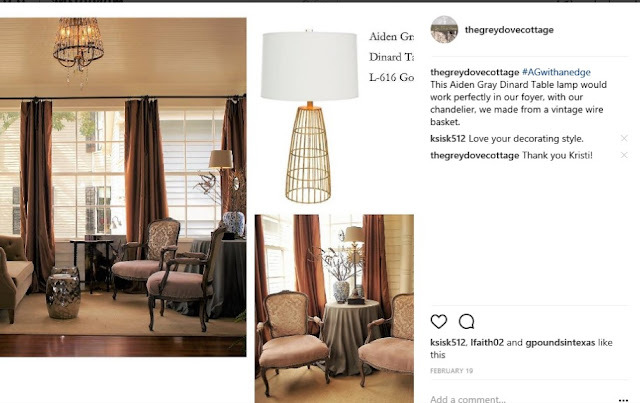 Aiden Gray is a home furnishings company specializing in; European inspired furniture, accessories, lighting, garden décor, also antique reproduction pieces. Aiden Gray launched a new more contemporary lighting line, with many of the new fixtures being showcased in the High Point home. 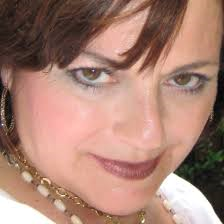 Joni Webb, of Cote de Texas hosted a contest with Aiden Gray. You may read about the contest by going here to the Cote de Texas contest post. 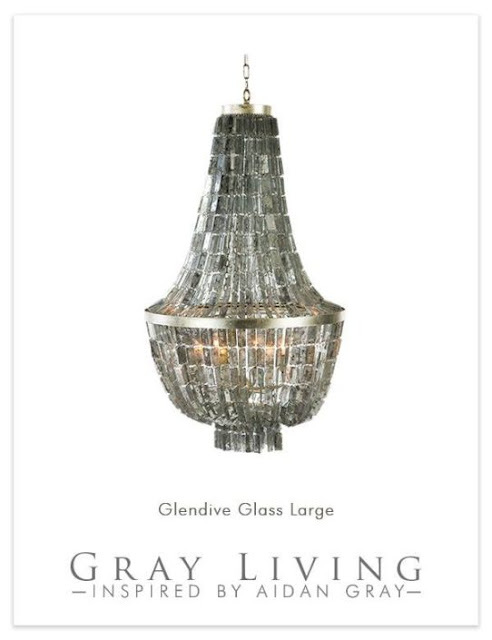 The concept was that as a Cote de Texas reader, we were invited to visit the Aiden Gray online catalog, then choose a lighting fixture we would love to own. You may visit the showroom by going here . At the time of the contest I had been working upon our foyer. It is a small space, where I've attempted to create a sitting area within a 7' X 13' footprint. Original the side porch, the foyer was taken in we suspect in the 1940's, it features exterior lap board, bead board, along with an original porch post. The space is clad with large paned French windows. There's also an odd niche where a window once stood (currently under another transformation). The foyer is a work in progress. We often entertain friends in the foyer, we share a glass of wine, along with a bit of tasty fare, while enjoying lively conversation. 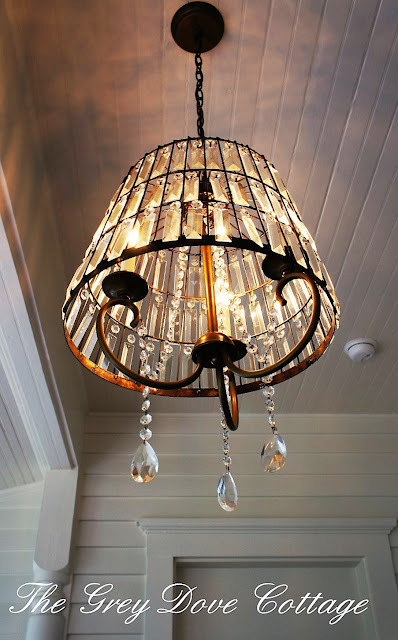 Mr. GDC and I some months earlier, created a chandelier from a vintage flea market basket, combined with a home improvement store petite chandelier, along with a box of crystal prisms. The end result was a rustic, refined unique creation. I had been searching for a table lamp to add to the space. 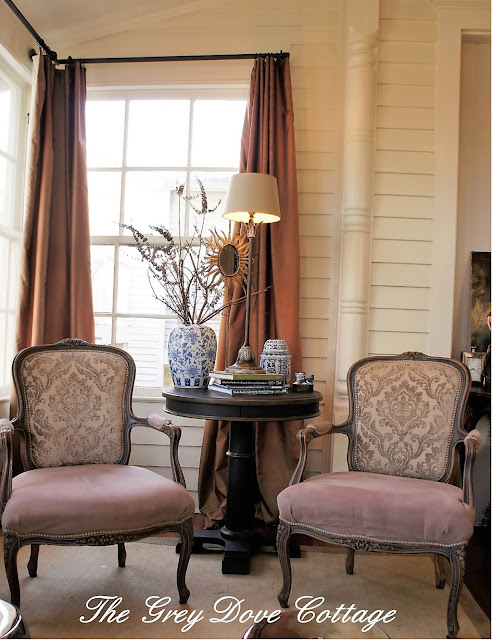 I use a wooden pedestal table between a pair of vintage French arm chairs in the space. The table is sometimes skirted, sometimes not, the tablescape is ever changing as well. 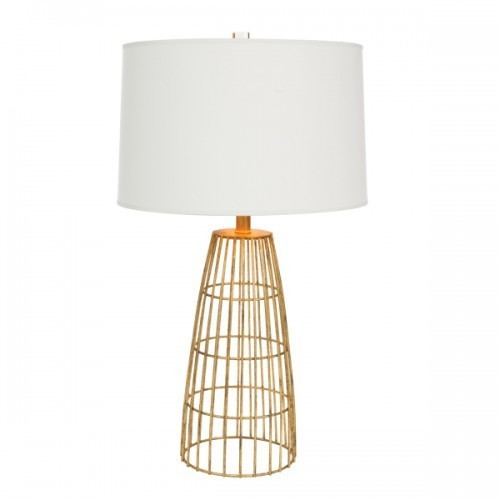 The opportunity to win an Aiden Gray table lamp made my heart sing! Eager, excitedly I perused the new lighting line by Aiden Gray. A departure from the elegant, classic European influence of previous lines, the new line definitely possessed an "edge". There were so many beautiful, unique fixtures; chandeliers, sconces, floor, also table lamps. One table lamp caught my eye, Dinard L616. The light is a metal cylinder of sorts, with similar rectangular design motif to the antique basket we used in making the "chandelier". The problem, it is only 28" tall. I felt I could place a riser beneath it; a capital, antique box, something that would bring the lamp up a bit taller. It's clean lines, contemporary edge would make a statement in our cottage interior, dressed in French. I made my submission, then crossed my fingers! Joni Webb, who's blog I have followed some ten years, has been of great inspiration to me. An Interior Designer, her projects, as well as classic aesthetic appeals to me. Her style is French, ever changing, while influenced by trends, she remains true to the collected, classic French aesthetic. Cote de Texas is a beautifully written collection of her work, home features, designer features, also practical design lessons. For me, she's the equivalent to a "Rock Star". I often grab a cup of coffee, settle into my grey velvet chair, prop up my feet, in preparation to wander over to her blog and be swept away. Yesterday was one of those mornings - as I began to read her blog my heart raced, it was the Aiden Gray contest winner announcement. She told me not to peek, couldn't help it! I peeked! Scrolled to the bottom of the page, scrolling upward ever so slowly, admiring contestant submission after contestant submission, my heart began to sink. I thought I hadn't won. Heavy sigh. Then as I made my way upward toward the top, "#5 Andi Cox we agree with you!" I'm sorry what? I WON! I won not only one Aiden Gray lamp, a pair!! I jumped up off my chair, nearly dropping my laptop balanced upon my lap, spilt my coffee, screaming, hands in the air, happy dance!!!! Thrilled, is an understatement - I haven't won anything since I was a small girl, back in Fort Worth, and scored a huge stuffed pink elephant from a local grocer raffle. I couldn't believe my luck. I brought in Jr., read this, did I win? He laughed, "Yes Mom, you won, told you the photos were ok." I fretted over my submission. I took a ridiculous number of photographs, trying to capture my vision. Bored Jr. to his wits end, forcing him to review each photograph with me. Could it be that Aiden Gray was able to see my vision? Seriously? I won? Me? I can hardly wait for the arrival of the Aiden Gray lamp. This little corner of Sybi's (our cottage) foyer will be made all the more special by the addition of a stunning Aiden Gray lamp, more of a work of art than a fixture. My heartfelt appreciation to Aiden Gray, Randal Weeks, also Joni Webb. I'll post again when my treasure arrives. Until then - I'll keep smiling. Thank you Heather. I'm excited to see the lamps too!